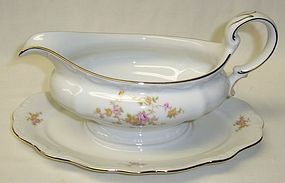 This is a really nice Michele Gravy or Sauce Boat with attached under plate made by Johann Haviland Bavaria Germany. The Gravy is signed on the bottom JOHANN HAVILAND BAVARIA GERMANY. The pink floral decoration and gold trim is in excellent condition. The Gravy Boat is in excellent condition with no chips, cracks or scratches. We guarantee items to be as described. Email any questions. THANK YOU. This is a really nice Michele 10 1/2 X 7 1/2 Inch Oval Vegetable Bowl made by Johann Haviland Bavaria Germany. The Bowl is signed on the bottom JOHANN HAVILAND BAVARIA GERMANY. The pink floral decoration and gold trim is in excellent condition with no chips or cracks. We guarantee items to be as described. Email any questions. THANK YOU. 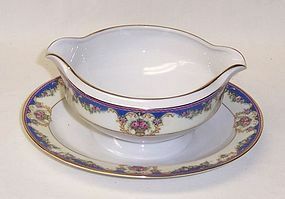 This is a really nice Windsor Number 4182 Gravy or Sauce Boat with Attached Underplate made by Tirschenreuth Bavaria. The Gravy is signed P.T. BAVARIA TIRSCHENREUTH WINDSOR #4182. It is in very good condition with no chips, cracks or scratches. We guarantee items to be as described. THANK YOU. 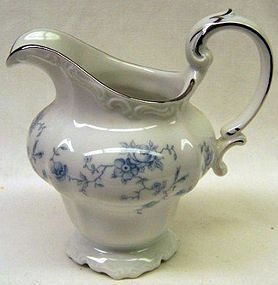 This is a really nice Blue Garland Footed Creamer made by Johann Haviland Bavaria Germany. The Creamer is signed on the bottom JOHANN HAVILAND BAVARIA GERMANY 23. The Creamer measures 5 inches high to top of spout. It is in excellent condition with no chips or cracks. We guarantee all items to be as described. Feel free to email any questions. THANK YOU.